Based in Glossop, Maria enjoys a busy and varied career combining professional orchestral, chamber and solo playing with teaching and coaching young musicians. Born in Merthyr Tydfil, she started the flute at the age of nine, studying with John Turner in her early teens. Subsequently she was awarded a scholarship to the Royal Northern College of Music to study under Kate Hill and Trevor Wye. As a professional flautist, Maria has played with the Hallé, BBC Philharmonic, Royal Liverpool Philharmonic, Manchester Camerata and Northern Chamber Orchestra. 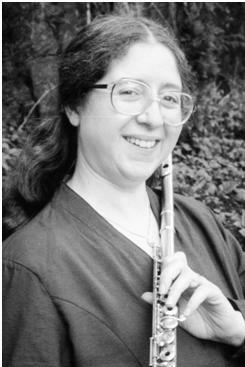 In 1985 she was a finalist in the “National Flute Association of America” competition which was held in Denver, Colorado. From 1987-91 she was principal flute with the East of England Orchestra (now Sinfonia Viva). She very much enjoys playing chamber music in a wide range of ensembles, and has performed as soloist in concertos including Mozart D Major, Bach B Minor Suite and Brandenburg 5, CPE Bach D Minor, Vivaldi “La Notte” and the William Alwyn Concerto. She has made two solo CDs, accompanied by her brother, Francis Rayner. Much in demand as a teacher, Maria really enjoys inspiring a love of music in the next generation, and in recent years has devoted much energy to developing opportunities for young musicians in the Peak District. Together with her husband Jeff, she has been involved in the development of a thriving music centre in the Dark Peak area. Maria is thrilled to be reunited with En for this performance as they first started playing as a duo back in their student days at the RNCM in the 1980s.